“The Western media has become so good at lying about this country,” says Charlie Kirk, founder of “Turning Point USA” organization, whose fact-finding mission showed him realities on the ground that will assist him in his pro-Israel advocacy on college campuses. 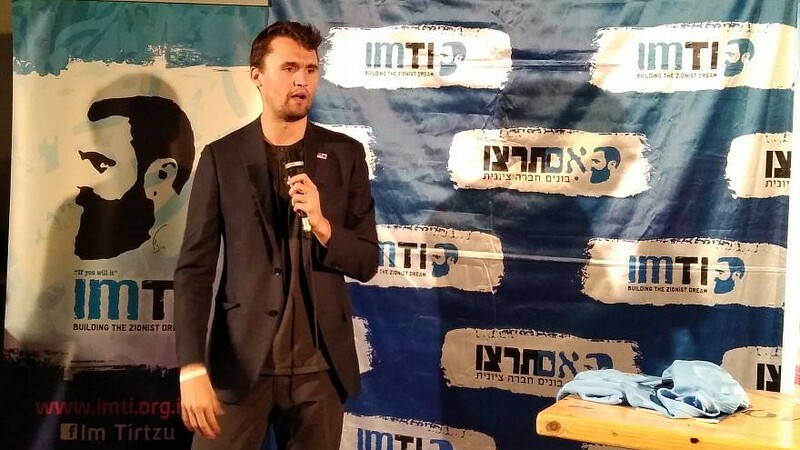 Turning Point USA’s Charlie Bar speaking at an event hosted by Im Tirtzu at a Jerusalem bar. Credit: Josh Hasten. 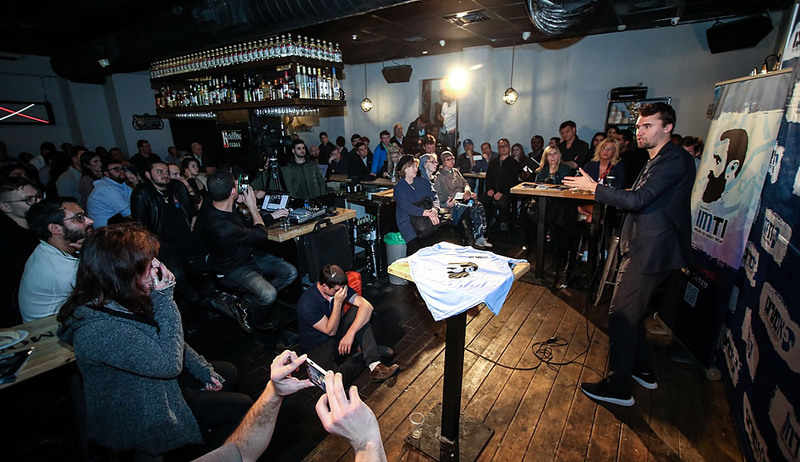 (March 20, 2019 / JNS) “The Western media has become so good at lying about this country,” says Charlie Kirk, founder of the Conservative “Turning Point USA” organization, referring to Israel as he addressed a standing-room only crowd in a Jerusalem pub on Monday night. His talk, organized and sponsored by the Im Tirtzu Zionist movement, drew a wide audience that included Israelis and immigrants, students from abroad, along with several Christian Arabs in attendance. It was during a fact-finding mission this week—visiting places like the Golan Heights, Hebron and the Israel-Gaza border—that Kirk saw firsthand how “programmed by the Western media” he had become to certain negative beliefs about the Jewish state. Kirk, who told the room that “I’m very pro-Israel, I’m an evangelical Christian, I’m a conservative, I’m a Trump supporter, I’m a Republican, and my whole life I have defended Israel,” says he was given a real eye-opener visiting the biblical town of Hebron. He says he thought that he would see Arab “refugees living in tents,” and instead was “shocked” to find a city “with malls, shopping centers, which is 97 percent Arab,” where it was the Jews whose access to most of the city he found to be restricted. While visiting the Golan, he was equally amazed to learn how Israeli hospitals treated Syrians wounded in that country’s civil war, despite the fact that Syria is an enemy country. And down near the Gaza border, he was more than surprised hearing how Israel evacuated nearly 10,000 Jewish residents from Gaza back in 2005 for “peace,” but was rewarded with rockets and cross-border terrorism. Only 24, Kirk has millions of followers on his social-media platforms and has utilized his Turning Point USA organization to work to fulfill its mission, according to its website, of building “the most organized, active and powerful conservative grassroots activist network on college campuses,” across America. Kirk warned that “college campuses are one of the biggest threats to the entire world” for their brand of radicalized leftist ideologies. A “leftist,” he says, will try to silence a person before they speak. Kirk says those types, as a result of their intolerance, constantly interrupt him and have even tried to get him banned from speaking on campus. While in Hebron, Kirk says he witnessed the Breaking the Silence (BTS) Organization’s tactics of trying to provoke Israel Defense Forces’ soldiers, noting their self-restraint as members of BTS he says got in the faces of the troops. He thinks Israel needs to be careful about groups like BTS, who create a moral equivalency, with media backing, between the moral conduct of the IDF and terrorists from Hamas. “What I saw in the Breaking the Silence folks, I saw the anger and I saw the intensity. It reminds me of the American left,” he said. In regard to sentiments on Jews and Israel in the U.S. halls of power, Kirk says that he is repelled that “there is real institutional anti-Semitism rising in the Democratic Party—not just rising, but it seems to be revealed.” He believes that the trend is not a media exaggeration but the current reality, citing recent anti-Semitic comments made by Minnesota Rep. Ilhan Omar. Kirk is referring to those who participate in Israel Apartheid Week and other BDS activity on campus. When confronted about other regions of conflict in the world, they tell him they have no intention of standing up against atrocities being carried out in places like Iran or North Korea, but are only interested in combating Israel. And that’s what Kirk is getting at: Programs dedicated to standing up against “a country the size of New Jersey” represent anti-Semitism, plain and simple.